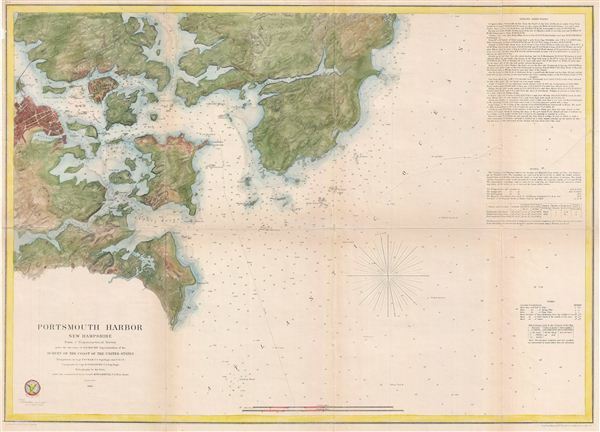 A beautiful example of the U.S. Coast Survey's 1866 nautical chart or maritime map of Portsmouth Harbor, New Hampshire. This map covers the city of Portsmouth, New Hapshire, and its vicinity from Odiornes Point and Sagamore Creek to Chauncy's Creek and Spruce Creek. It includes Great Island, the Navy Year, Kittery Maine, and countless smaller islands. This 1866 map represents the culmination of the Coast Survey's work in the vicinity of Portsmouth. Unlike earlier issues, this example presents rich topographical detail as well as hydrographical data. There are countless depth soundings throughout and the right-hand quadrants feature sailing instructions, notes on tides and light houses, and a wealth of other practical information for the mariner. The city of Portsmouth itself is beautifully illustrated with numerous individual buildings and all major streets rendered. Very good condition. Some wear and toning on original fold lines. Backed with archival tissue for stability.